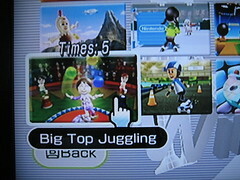 Read on for some mii juggling in Wii Fit Plus, and some iPhone mini-reviews. 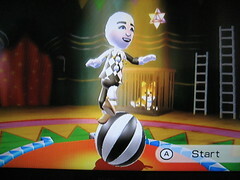 Anyway, one of the new Mini-games for Wii Fit is this juggling one. What makes it hard is not necessarily the juggling, although that can get a bit tricky with more than two balls, it’s the fact that you have to balance left and right while you’re doing it. Basically, you’re in a ring in the bigtop, and you’re standing on a rolling globe (aka, giant ball). Fortunately, there is no forward backward balance required, as I think the left/right is hard enough. You have the wii controller in your right hand, and the nunchuck accessory in your other, and you basically just flick each one up when you catch a ball in the corresponding hand. Fun stuff, and really, it’s the closest to any sort of juggling simulator I’ve ever seen in a video game. Soon after, I downloaded another juggling related app called “Circus Clown”, which is also no longer available. In that one, you ride a unicycle back and forth across the screen, catching stuff (or avoiding it, I can’t really remember) using the accelerometer. It was quite simple, but hey, a unicycle! A new search reveals that there are several new iPhone juggling and circus arts apps. Maybe I’ll download a few and write a follow up. This entry was posted in Console Games, Reviews by Martin. Bookmark the permalink. 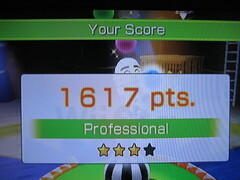 It was fun to watch you and mike juggle on the Wii last night! Did you, by chance, catch Cirque du Soleil when it was in town? There was this totally amazing juggler, Anthony Gatto. I mean, it was unbelievably awesome. Yes! Florence and I actually saw Kooza in Chicago (before it came to mpls), because we happened to be there when it opened. Anthony Gatto is widely regarded as the best numbers juggler in the world. Definitely amazing stuff.